Magnetic Stellar Nurseries. Spiral arms of galaxies are usually traced by star clusters and dark dust lanes, which serve as the nurseries of stars. Theorists have been debating whether these nurseries are threaded by ordered magnetic fields, which may control the star birth. This kind of fields is now spotted in the face-on galaxy M33. The magnetic fields of galaxies may affect how fast stars are born, by influencing the giant molecular clouds that serve as stellar nurseries, researchers say. The researchers, addressing a long-running debate about these vast magnetic fields, reached their findings by studying M33, the nearest galaxy that we can see almost face-on. Astronomers know that molecular clouds up to dozens of light-years across have pockets of gas that will form stars when they become dense enough to collapse under their own gravity. Still, much is poorly understood about the precise way in which these stellar nurseries take shape. Some models of giant molecular cloud formation suggest that galactic magnetic fields could be strong enough to impose on clouds, influencing how the cloud accumulate and fragment and thus how quickly and efficiently stars form. Other models, however, suggest galactic magnetic fields are irrelevant to cloud formation, since movements within the clouds might randomize the orientations of their magnetic fields. Trying to study the Milky Way to analyze whether galactic magnetic fields affect giant molecular clouds is challenging: Any effects that galactic magnetic fields may or may not have on clouds within our galaxy would best be seen from above the Milky Way instead of from our place within it. "The simple question of whether magnetic fields play an important role in star formation has been debated for decades, owing much to the difficulties on observations," study lead author Hua-bai Li, an astrophysicist at the Max Planck Institute for Astronomy in Heidelberg, Germany, told SPACE.com. 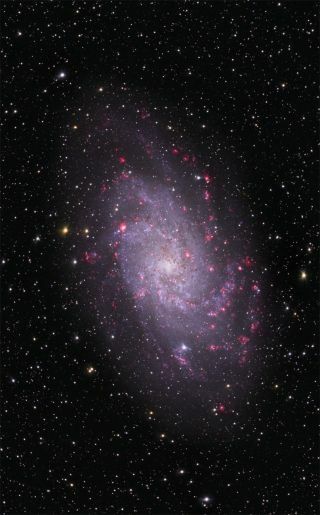 So researchers investigated M33, which is about 2.9 million light-years away and has spiral arms similar to those of our own galaxy. Using the Submillimeter Array of radio telescopes in Hawaii, the researchers observed giant molecular clouds in M33's spiral arms. By analyzing how the light from these clouds was polarized, they detected how the clouds' magnetic fields were oriented, and discovered that the fields were aligned with the spiral arms. This suggested that they are being influenced by the galaxy's magnetic field. Li and his colleague Thomas Henning detailed their findings online today (Nov. 16) in the journal Nature.